22 november, 2014 Säg något! Man I am so glad that next week is going to be a “normal” work week. I’ve had my hands full with some courses, both learning and holding my own. And right now I’m so tired of it, but I have a two day course left to hold in the beginning of December then that’s over for this year. Then we’ll get ready for some new stuff next year, I might be tried of it right now but it is fun. I wouldn’t have done it if I though it was crap or I didn’t get any satisfaction from it. That would just be wasting everyones time. Since it’s been a rough past two weeks, I haven’t been playing like I wanted to. And I’m not really feeling it today, so I might just watch a movie or something. But I am about 11hours into Tales of Hearts R and I love that game! No surprise there! Tomorrow is game day, so I’ll be spending the whole Sunday just playing. Nothing else matters! 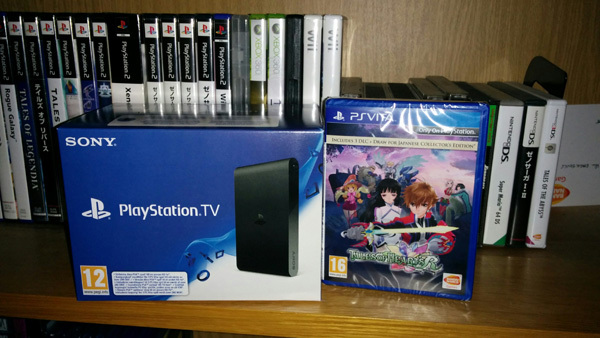 I love playing the game on the PlayStation TV, it works great! I just hope they add more support to the thing. Like some of the old PSP Final Fantasy games from PSN and stuff like that. Come on Sony and add more games to your whitelist!